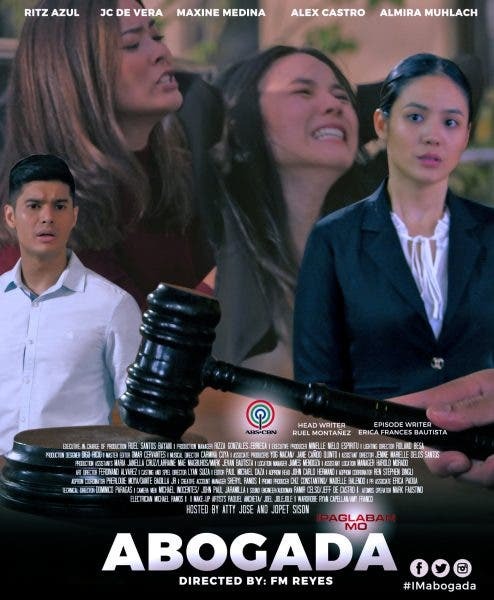 Ritz Azul will play a lawyer whose reputation and career are on the line as she faces an accusation questioning her morals on “Ipaglaban Mo” this Saturday (October 20). Annie (Ritz) worked hard to achieve her dream of becoming a good lawyer. She has sacrificed so much of her time and energy in pursuit of her dream that she did not leave much time for herself to find love. However, love will find her in the person of Max (JC de Vera). The two had a relationship and a child together. Annie did not mind that Max has children from a previous relationship and even agreed to marry him abroad. Upon their return to the Philippines, Annie found out that Max is actually still married when his wife, Trina (Maxine Medina), filed a case of concubinage against them. Trina also tried to get Annie disbarred so she can no longer be a lawyer. How will Annie defend her reputation and career, which she worked hard for years to achieve? Will she remain a lawyer despite the allegations against her? Don’t miss the “Abogada” episode of “Ipaglaban Mo,” directed by FM Reyes, this Saturday (October 20) after “It’s Showtime” on ABS-CBN.